Hello again, everyone! I know I have been MIA, but if you follow me on Facebook, you have been reading about the on-going saga after my unfortunate use of the Cutex Non-Acetone Polish Remover. Here's a brief recap: I used the remover after my mom picked up the wrong color bottle at Harmon's, immediately felt the skin of my fingers had a weird texture, and noticed the next day that they looked like alligator skin. It was as if I painted my fingers with clear nail polish and it dried all cracked. That's honestly what I thought had happened. I really thought I had spilled top coat on myself and not realized. Now, you all have TOTALLY seen my skin before. And while there was a point in time that my cuticles were a little shoddy, they were NEVER this bad. I mean, I was embarrassed to show my hands at work. I was applying lotion every ten minutes to moisturize to the point of concealment. But that only worked for so long. Luckily, I recently became a Tweezerman Ambassador. 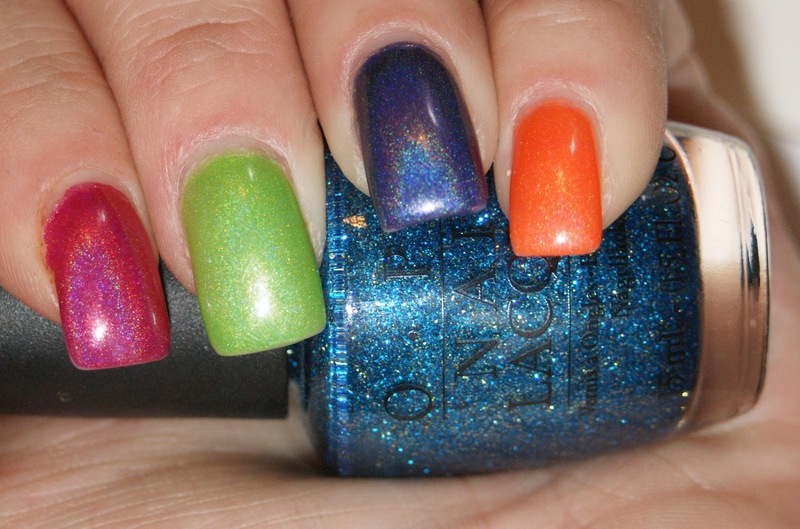 They sent me a BEAUTIFUL nail care kit that I immediately fell in love with upon opening. Look at how amazing that is! I have everything that I need for my hands and feet, all of the highest stainless steel quality. I'm seriously in love. AND check out that bonus LE tweezer in the top left corner. Queen Polish has stolen it to take to Disney with her and my sister this weekend for Lady Polish's belated birthday trip. I received the 5-pack of emery boards, an Eco-Friendly Medium Grit file, and Sansation Nail File . The emery boards are awesome, as is the medium grit file. But I love the fact that the sansation is the perfect course grit at 100/180 AND is both washable and disinfectable. 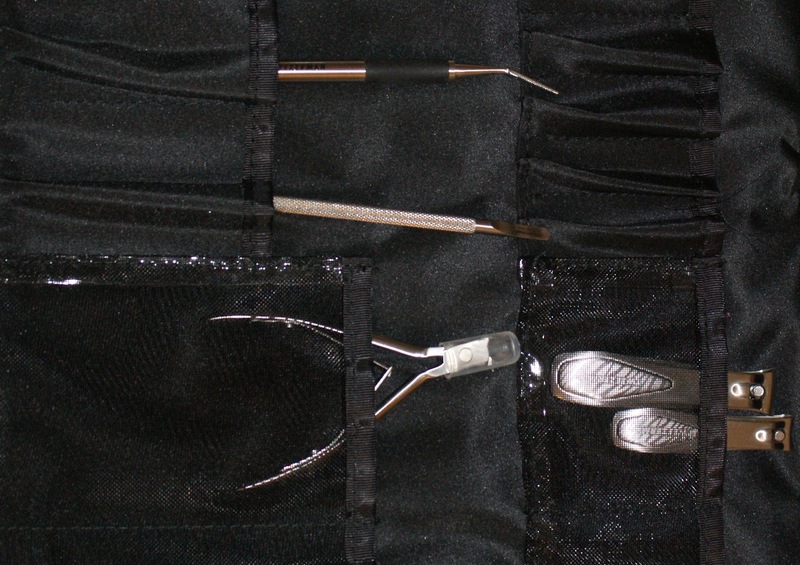 Here is the Ingrown Toenail File, the Pushy and Nail Cleaner, the Zebra Satin Fingernail/Toenail clippers, and the Zebra Satin Cuticle Nipper . The Ingrown Toenail File is the only thing I could not review, due to not having that issue. But more on the aforementioned items in a bit. Though seriously, let me tell you... you'll never need anything else again. At the time I received this package, I decided I would embark on a month long nail care challenge and was really diligent about maintaining my cuticles and skin. So you can imagine my horror when that all went down the drain. First up was Pushy! Of course, this was used to push back my cuticles! And these are the dual sides of Pedro. I actually used this to scrub my finger tips to help get rid of the dead skin for the first three days. And I can't forget the Zebra Cuticle Nipper... HOLY HELL, I cannot forget it! What's nice about these nippers is that you can pull them as far apart or as close together as you need, depending on the situation, because of their spring mechanism. Before using these, I slathered my fingers in cuticle oil and very gently, nipped at the spots I knew the dead skin was located. 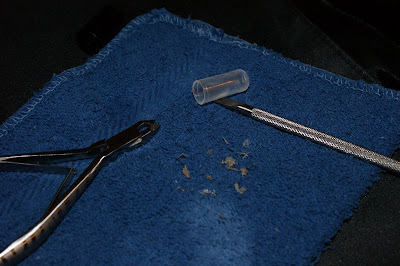 This included my finger tips and cuticles, but only while the oil was on. See all that dead skin? 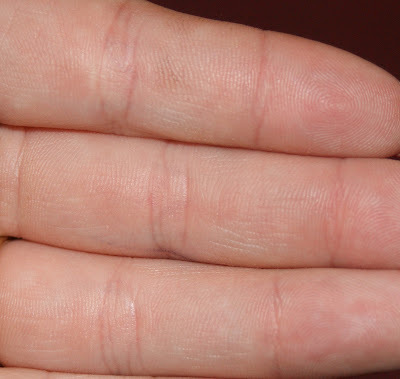 THAT WAS JUST FROM MY PINKY FINGER! Now, can you truly comprehend my horror? Of course, when I was done, I moisturized with lotion. Lots of it. And then there was the clincher. One would not think the nail file would play into my grand plan, but alas, it was my savior. Once my skin was no longer scaly and had turned completely into the flaky phase, I remembered reading somewhere that men with flaky hands after a hard day's work would rub their skin with sandpaper. Well, it was 2am and Home Depot wasn't open, so I improvised with this Course/Medium file. Screw sandpaper, this ROCKED. I did it lightly over my skin, but it was magical nonetheless. This file was really my godsend that was the final nail in the scaly skin coffin. Indeed it is! 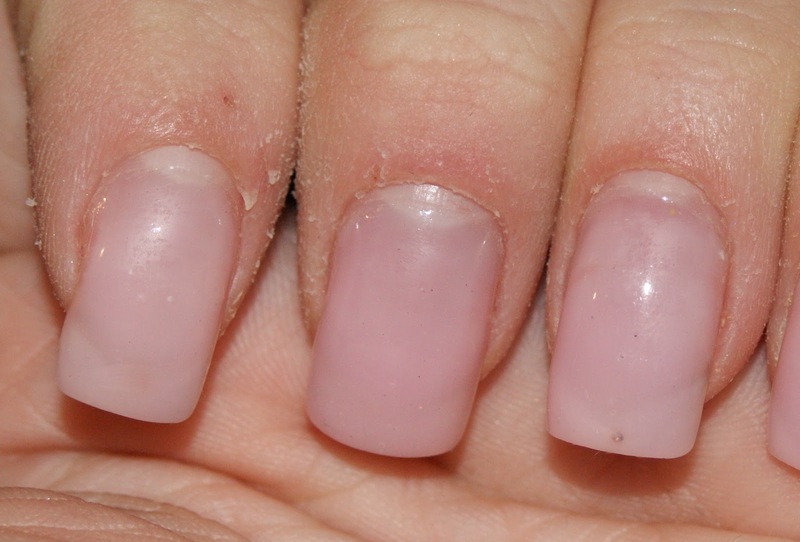 NORMAL SKIN AND CUTICLES! My hands have returned to their former glory in just 7 days! I always knew that Tweezerman made high quality products. Stainless steel tools are always the way to go. But Dear God, I did not KNOW how good they truly are. So, as evidenced by the photos above, it is with 100% confidence and immense gratitude that I state that Tweezerman TRULY saved my skin! 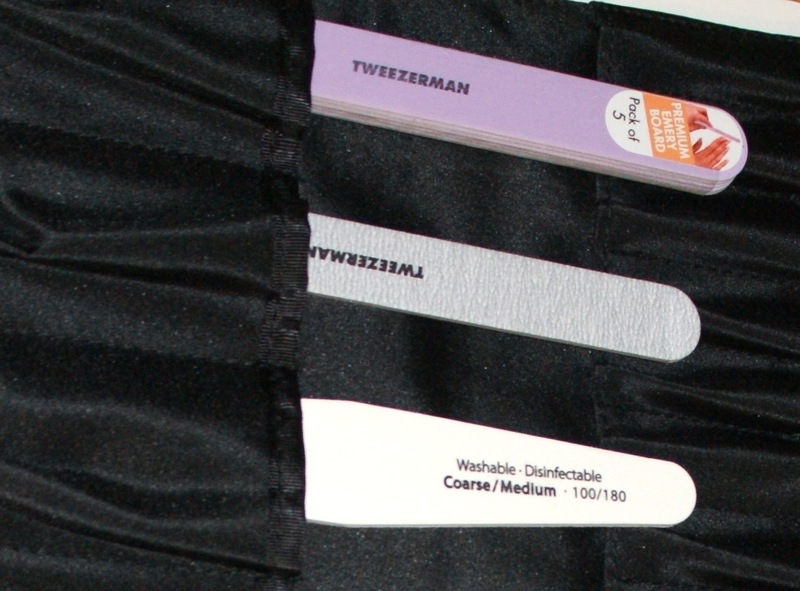 Check out the products shown above, as well as their entire line of nail and brow products, and find your nearest retailer at their website, Tweezerman.com. Also, be sure to keep your eye on their Facebook and Twitter pages for product news and updates! BONUS: They offer a free sharpening program too! What do you think of the before and after pics? Can you see how traumatic this experience was?!?! Are you already a Tweezerman devotee or did I convert you? Wow! I love reading stories and reviews like this. Although I find that Tweezerman can be a little pricey, I would totally invest in their products after reading this! Everyone has their emergencies and mishaps with cuticles/hang nails/dry skin, and even though your pictures were graphic, I think that they were necessary and informative. I'm glad this routine worked for you! I know how hard it can be when your cuticles aren't looking their best when you're a blogger! I have pushers, files, and cuticle nippers from other brands, but these are not only amazing, but they come with a quality guarantee and free sharpening. I know the pics were a little on the gross side, but I think that just shows just how crazy it that it was fixed in a week. this is truly amazing. I might need to invest in this after reading your (horror) story. Wow! I have never had non-acetone remover do that to me, but then again, I haven't used it in years. I'm so glad you had this kit to help you get your skin back to normal. It's a good investment if one can afford it. The Tweezers are also the business!! When you have time to use them, please do. You'll see how great they are. UGH - Sorry about your hands. They look beautiful now though. I often wonder about the long term effect of using acetone polish remover...(I am an environmental engineer...so I always wonder). The tweezerman looks like it works well. I might have to grab one. Thanks for the review. Yikes, so much for non-acetone not drying out your skin! Amazing you were able to recover so quickly from that kind of damage. Talk about the right tools for the job!